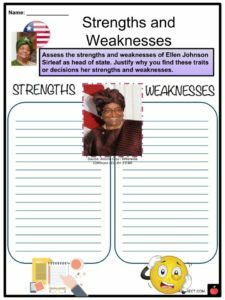 Ellen Johnson Sirleaf is a Liberian politician and economist who was the first elected female president in Africa. 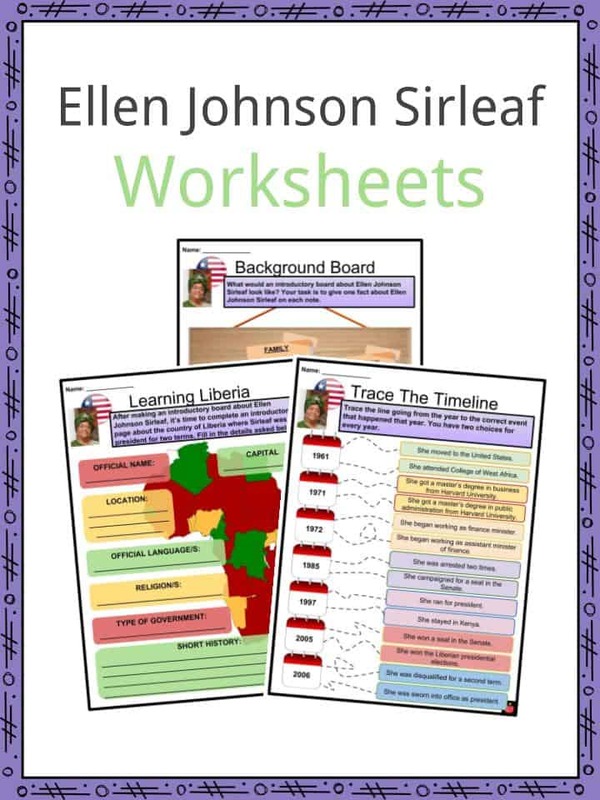 See the fact file below for more information on the Ellen Johnson Sirleaf or alternatively, you can download our 22-page Ellen Johnson Sirleaf worksheet pack to utilise within the classroom or home environment. 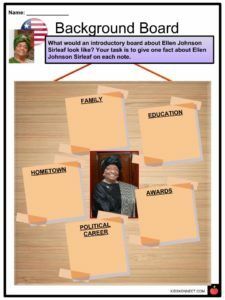 Ellen Johnson Sirleaf was born as Ellen Johnson on October 29, 1938 in Monrovia, Liberia. Johnson’s mother was of mixed Kru and German heritage while her father was of Gola ancestry. Johnson’s father was the first indigenous Liberian to be seated in national legislature. She attended the College of West Africa in Monrovia. At 17 years old, she married James Sirleaf. In 1961, she moved to the United States and pursued further studies in economics and business administration at Madison Business College and Harvard University. 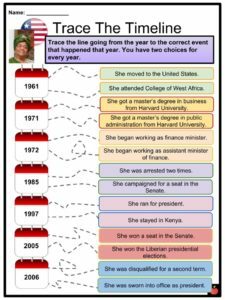 In 1971, Ellen Sirleaf obtained a master’s degree in public administration from Harvard University. Afterwards, she returned to Liberia and began her work in the government and public service. From 1972 to 1973, before the military coup in 1980, she served as assistant minister of finance under President William Tolbert. From 1980 to 1985, she served as finance minister during the dictatorship of Samuel K. Doe. She was arrested two times during Doe’s rule. In the 1985 national election, she campaigned to be a Senator. During her campaign, she publicly criticized the military dictatorship, which led to her house arrest. She was then sentenced to 10 years in prison in August 1985. 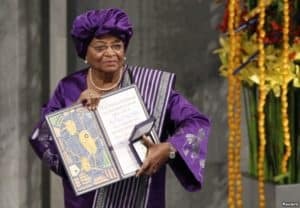 Because of international appeals for Sirleaf’s release, she was pardoned in September and allowed to leave the country. She spent 12 years in exile in the United States and Kenya. From 1992 to 1997, she served as the director of the Regional Bureau for Africa of the United Nations Development Programme. In the 1997 general election, Sirleaf returned to Liberia and ran for the Unity Party as the presidential candidate. She lost and placed second to Charles Taylor in the 1997 elections. From 1989 to 2003, bloody and chaotic civil wars wreaked havoc in Liberia. 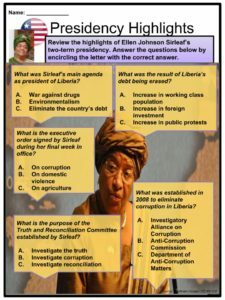 Upon Taylor’s exile in 2003, Johnson Sirleaf went back to Liberia to be the chairperson of the Commission on Good Governance. In 2005, she ran again for a presidential position. Her platforms included rebuilding infrastructure, uniting the country, and ending civil conflict. She was known as Liberia’s “Iron Lady”. She defeated George Weah and was elected as the Liberian president in 2005. She was sworn into office on January 16, 2006. 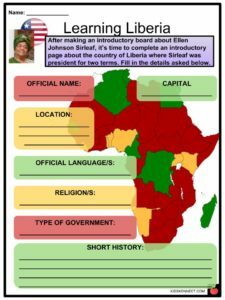 Sirleaf decided to run for a second term despite having vowed to serve only one term. The 2011 election was considered controversial when her opponent dropped out and there was a low voter turnout. She still won more than 90 percent of the vote and was re-elected as president in 2011. 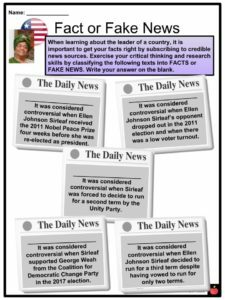 When the Ebola outbreak happened in 2014, she was openly criticized for her decision to send troops to quarantine the infected. In the 2017 presidential campaign, despite being from the Unity Party, Ellen Sirleaf supported George Weah from the Coalition for Democratic Change Party. Because they didn’t support their own party’s presidential candidate, Sirleaf (together with other officials) was expelled by the National Executive Committee of the Unity Party. One of Sirleaf’s main agendas as president was to eliminate Liberia’s debilitating debt. By 2010, she was able to erase almost the entire debt of the country. This led more foreign investment to enter Liberia. In 2006, she established a committee to investigate corruption and reconcile ethnic conflicts. The committee is called the Truth and Reconciliation Committee (TRC). In 2008, the Anti-Corruption Commission was established to eliminate corruption in Liberia. The country’s battle with corruption continued on until Sirleaf’s second term. Sirleaf signed an executive order on domestic violence during her final week in office. The executive order states that women, men, and children must be protected against abuse whether physical, sexual, economical, emotional, or psychological. She has four sons with James Sirleaf. In 2010, Sirleaf released her book entitled This Child Will Be Great: Memoir of a Remarkable Life by Africa’s First Woman President. In 2007, President George W. Bush awarded her the Presidential Medal of Freedom. She received the 2011 Nobel Peace Prize for her work in the advancement of women’s rights. Leymah Gbowee of Liberia and Tawakkol Karman of Yemen also won the 2011 Nobel Peace Prize with her. She received the 2011 Nobel Peace Prize four days before she was re-elected as president, which added to the controversy of that election.